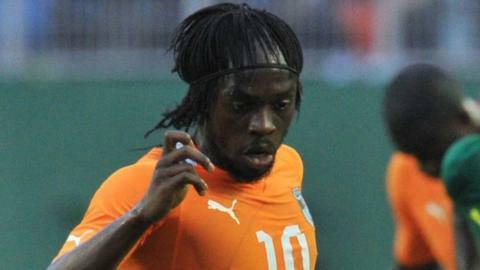 Arsenal and Ivory Coast striker Gervinho has been ruled out of action for three weeks with an ankle injury. It means the 25-year-old is set to miss to three matches for his club and the international friendly against Austria in Linz on 14 November. That game is Ivory Coast's penultimate warm-up before the 2013 Africa Cup of Nations in South Africa, to be held between 19 January and 10 February. The Elephants' final friendly will be against DR Congo on 14 January. Eight days later they will face Togo in the opening fixture in Group D of the Nations Cup. Gervinho has been in good form this season and scored in Ivory Coast's 4-2 win over Senegal in the first leg of the Nations Cup final-round qualifier. And he played in the second leg in Senegal that was abandoned because of crowd trouble with Ivory Coast leading 2-0. Senegal were later disqualified and Ivory Coast declared winners of the tie. The forward has also enjoyed a decent start to the new campaign at Arsenal, hitting the target five times. But he will now miss the Gunners' matches against Manchester United, Fulham and Tottenham in the Premier League as well as the trip to Schalke in the Champions League. Gervinho suffered the ankle problem during Arsenal's Premier League against QPR at Emirates Stadium on 27 October. He was on the pitch for only 11 minutes after coming on as a 71st-minute substitute before he was forced off.